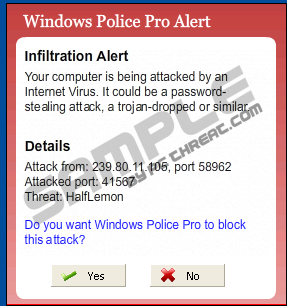 Windows Police Pro Alert Pop-up is yet another fake pop-up message affiliated and utilized to promote the rogue antispyware tool: Windows Police Pro. Once a computer system has been infiltrated with the Windows Police Pro rogue application, it goes to work to complete its task of ensuring unsuspecting users fall prey to their tactics, and ends up purchasing their full version of the malware – this way ensuring the creators of this rogue tool makes off with the user’s hard earned money. As soon as the user clicks on either button: “Yes:” the rogue will be activated and will either redirect the browser to its affiliated website, so as to secure a purchase from the user, or may install accompanied and bundled associated malware. It is quite apparent that the Windows Police Pro Alert Pop-up is NOT to be trusted, and should a user be experiencing this pop-up alert, they will need to remove the rogue Windows Police Pro and all its affiliates from the infected system. It is highly recommended to make use of the services of an up to date antispyware application, in order to rid the infected system of the Windows Police Pro Alert Pop-up and all its components. Quick & tested solution for Windows Police Pro Alert Pop-up removal.